The UK and Ukraine will continue to strengthen their defence partnership in the face of intensifying threats and aggression, the Defence Secretary reaffirmed today. In a meeting with the visiting Ukrainian Defence Minister Stepan Poltorak, Gavin Williamson announced a range of forthcoming deployments and exercises that will see the two countries’ Armed Forces continue to work together in defence of the international rules-based order. 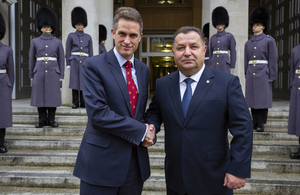 As long as Ukraine faces Russian hostilities, it will find a steadfast partner in the United Kingdom. By continuing to work together, whether through training programmes or military exercises, we help Ukraine to stand up for our shared values. Those values of freedom and democracy cannot be traded. I have witnessed on the frontline the effects of the conflict in the East and this has completely reinforced my support for Ukraine’s sovereignty, independence and territorial integrity. The United Kingdom is a valued partner that has supported Ukraine’s Armed Forces for the last four years in the face of Russian aggression. As we fight to defend our territory, the offer of extended support from the UK Armed Forces is vitally important and gratefully received. The Defence Secretary announced at the meeting that HMS Echo would deploy to the Black Sea in 2019 to demonstrate the UK’s support to ensuring freedom of navigation in the region. It was also confirmed that, in January and February next year, training teams – made up of personnel from the Royal Navy, Royal Marines and the Army – will deploy to Ukraine as part of the extension to the UK’s military training operation announced by Gavin Williamson on his visit to the country in September. The UK and Ukrainian Armed Forces will gain another opportunity to develop capability and share expertise when UK contributes to the US-Ukrainian led Exercise Sea Breeze next year. While visiting Ukraine in September, where he visited the east of the country to see first-hand the effects of the ongoing conflict, the Defence Secretary announced that the UK would be extending its military training programme, delivered through Operation Orbital, until 2020. Since the start of 2015, British personnel have trained over 9,500 of the Ukrainian Armed Forces.